One of the things I have in place to supplement my income as a massage therapy is creating websites related to massage therapy – like this one. My first site was www.thebodyworker.com (Now defunct) that I used to just put my notes from massage school online. The way it came about was that I a was having health challenges that kept me from working. At the time it was just a hobby to keep me busy when I felt bad. I started it in 1999 or so and didn’t know anything about creating sites. From there I somehow found an ebook called Make Your Site Sell, by Ken Evoy and learned more and more about the possibilities of creating income from a website. Today that ebook has worked itself into a whole online business creating system and website builder – SBI! (Solo Build it! previously Site Build it!). What would you do a site on? What are your hobbies, interests, passions? What do you know alot about? What are you an expert at or what are you an expert at doing? Massage, some aspect of health, knitting, soccer, stock trading, gardening, dog training, destinations, your local community….. you name it. It can be made into a profitable topic…somehow….someway. The way it is done is to take these hobbies, passions, interests and expertise and start with brainstorming your topic through a comprehensive process of keyword research. (Using proprietary software included with SBI.) The software gives you an idea of how many searches there are for that word compared to how many sites there are that provide that information. It also takes into consideration possible ways to make money. Don’t think you have anything worth writing about? Think again. Don’t let your old fears get in your way. A website on all of the research on massage therapy that takes each study step by step and analyzes it and then explains how massage therapist can use this information. How to teach couples massage classes to the public to make money doing that and to build your massage business too. How to start and run a mobile massage business. How to start and run a massage therapy co-op. A site on all of the various online scheduling apps/systems and reviews of them all. A site that talks about the issues of being a male massage therapist. A website that deals with the issues of sexual assault, illegal massage businesses and human trafficking issues and that promotes massage therapy. Responsible – REAL massage therapists recognize the honor of responsibility that comes with providing people with massage. Ethical – REAL massage therapists are bound by best practices conveying ethical business sense. Accountable – REAL massage therapists thrive in accountability to, and encouragement of, one another as we help each other grow our businesses to reach their potentials. Licensed – REAL massage therapists in WA states are licensed through the Department of Health, being recognized as healthcare practitioners. I feel really concerned about the plastic thing… the pictures of plastic in the oceans and all over and how we got this way and what we can do about it. I don’t know anything about it but it is worrisome and would take some reading and research. I love reading books and keep thinking I should do a site on some aspect of reading – – not sure what aspect…but I am sure I could find it. A website on feral cats living in barns. I can hear your objections already…. aren’t there enough websites on those topics? There are never enough GOOD ones let alone GREAT ones. Just look at the sites out there. Most are getting so spammy with ads popping up all over and having stories that you have to click 100 times to see all the images just to get to the one important thing…. We need better websites that inform and educate. Take a look at these case studies and this list of results and list of websites using SBI for proof. In the early days, I made the most of my income from Google Adsense. Putting Google ads on my site. How much? Well it got up to about $2000 a month before 2009 when Google made big changes in their search algorithms. Since then I have started writing ebooks and am not getting back to working on a few sites that will have more Adsense ads and affiliate income mainly through Amazon associates program. You don’t know anything about creating websites? It’s a process. It takes as long as it takes. It won’t happen overnight and it isn’t a get rich quick thing. Step by step…little by little…. massage therapy is being accepted by health insurance. The latest step is the news that 270 Medicare Advantage Plans WILL be covering massage therapy. It was a part of recent efforts by AMTA to make this happen. The Centers for Medicare & Medicaid Services (CMS), the federal government department that administers the Medicare program, recently issued guidelines that named massage therapy as a medically-approved, non-opioid treatment alternative. Medical advantage plans are HMO or PPO plans that are approved by Medicare. 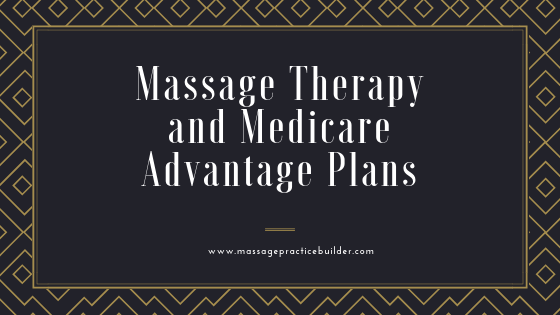 There are many different types of Plans so it is not clear where the massage therapy benefits will come into play. People purchase these plans above and beyond their Medicare coverage. We don’t really know yet and don’t have enough information. That specific language is concerning to me… do they mean that massage therapy will only be used in home based palliative care situations and not be a part of rehabilitation benefits to reduce pain and help deal with musculoskeletal injuries? What plans will cover massage therapy? What is the language in each plan that says massage therapy will be covered? Is there a definition of medical necessity in each plan around the massage therapy benefits? What does it say? Will massage need to be medically necessary? What will be covered? Will it cover massage for rehabilitation from surgery, injuries or just the palliative care? Will it cover massage therapy for cancer recovery? What CPT code will be allowed? 97124 or 97140 are the two main codes allowed now by health insurance. How will medicare be billed? 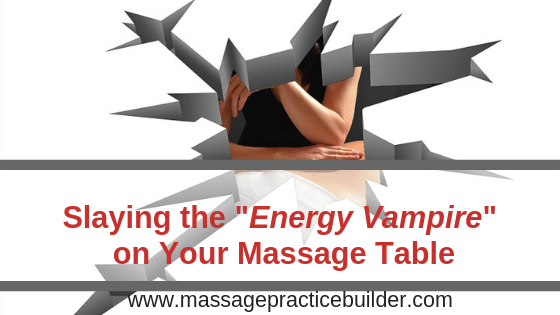 Will billing insurance make your massage business more profitable? See the formula for figuring it out. Massage therapy’s role in integrative health care has become widely accepted in major hospitals and in daily medical practice. A wealth of research has also shown the impact of massage therapy for pain management and relief. Health insurance in WA does not cover massage therapy for stress, depression and anxiety which could be added to the list. WAC 284-170-270 Every category of health care providers. 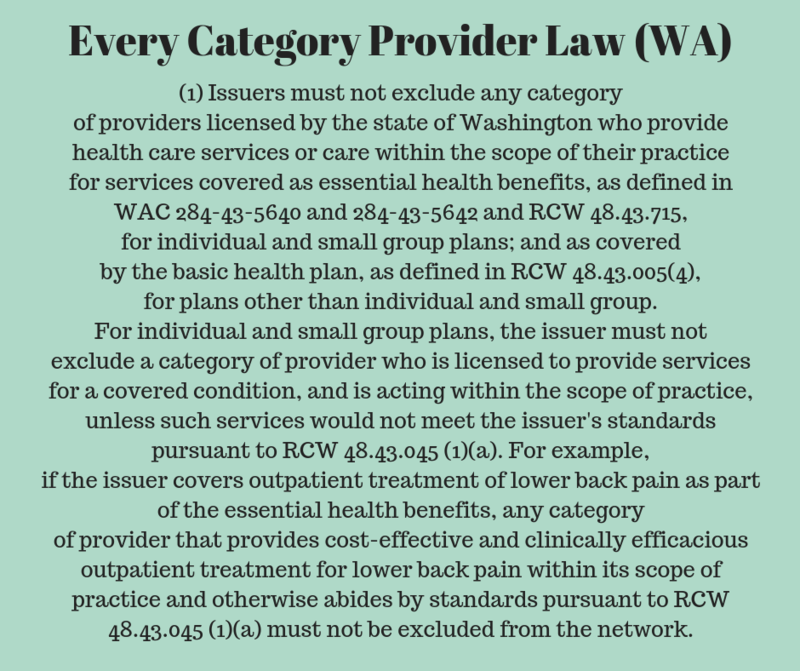 (1) Issuers must not exclude any category of providers licensed by the state of Washington who provide health care services or care within the scope of their practice for services covered as essential health benefits, as defined in WAC 284-43-5640 and 284-43-5642 and RCW 48.43.715, for individual and small group plans; and as covered by the basic health plan, as defined in RCW 48.43.005(4), for plans other than individual and small group. For individual and small group plans, the issuer must not exclude a category of provider who is licensed to provide services for a covered condition, and is acting within the scope of practice, unless such services would not meet the issuer’s standards pursuant to RCW 48.43.045 (1)(a). For example, if the issuer covers outpatient treatment of lower back pain as part of the essential health benefits, any category of provider that provides cost-effective and clinically efficacious outpatient treatment for lower back pain within its scope of practice and otherwise abides by standards pursuant to RCW 48.43.045 (1)(a) must not be excluded from the network. With the combination of Medicare recognizing massage therapy and the precedent set in WA State, massage therapy is on its way into healthcare – whether we want it or not. There are many issues in being a part of healthcare that we are not prepared for. We do not have enough in the way of advocacy in place to talk to the insurance carriers and legislators who create the laws. We need to be at the table or we will be on the menu. I have my own ideas on what needs to happen to get massage therapy covered by health insurance from my experience of billing insurance in WA State (billing PIP, workers comp since 1990 and health insurance since about 2000) and working with the local massage associations and being a board member for awhile for WSMTA and now the Political Action Committee in WA State – WAMAH. All over the US, various organizations are calling for the inclusion of massage therapy in healthcare to help combat the Opioid epidemic and more. Massage Therapy can help with pain relief and management, and can be a big part of resolving many musculoskeletal injuries and conditions. Many organizations are calling for alternative options for pain such as massage therapy among other therapies. “(1) Issuers must not exclude any category of providers licensed by the state of Washington who provide health care services or care within the scope of their practice for services covered as essential health benefits, as defined in WAC 284-43-5640 and 284-43-5642 and RCW 48.43.715, for individual and small group plans; and as covered by the basic health plan, as defined in RCW 48.43.005(4), for plans other than individual and small group. The Every Category Law was fought by the insurance companies for about 5 years and guess what…. the Every Category Law won and won big. A Supreme Court decision ended the battle with the Every category law moving forward.See the time line of events in implementing the Every Category Law in WA State – Report of the Clinician Workgroup on the Integration of Complementary and Alternative Medicine January 2000. Washington State. The insurance companies in WA State also require that there be a loss of function AND pain in order for massage therapy to be covered by health insurance. That means massage therapy is used to help with many conditions such as carpal tunnel, herniated discs, headaches and much more than just pain issues. In 2010, The Affordable Care Act opened the doors with Section 2706 that said insurance companies “shall not discriminate”against any health provider with a state-recognized license. Section 5101 includes licensed complementary and alternative medicine providers and integrative health practitioners in its definition of health professionals in the“health care workforce.” Yet nothing was done by any of the massage therapy associations. In 2011, Relieving Pan in America:(PDF) A Blueprint for Transforming Prevention, Care, Education, and Research said reviews of research on acupuncture, massage, and chiropractic spinal manipulation for chronic low back pain suggest these therapies may be beneficial. In Jan 2018, the Academy of Integrative Pain Management (AIPM) and the US Pain Foundation, wrote a letter to the U.S. Senate Committee on Finance (the Committee with jurisdiction over the Centers for Medicare and Medicaid Services, or CMS), asking them to cover massage therapy. In April 2017, Federation of State Medical Boards April 2017 adopted their policy on Chronic use of Opioids and recommended: “The treatment plan may contain information supporting the selection of therapies, both pharmacologic (medications other than opioids to include anti-inflammatories, acetaminophen, and selected antidepressants and anticonvulsants) interventional, and non-pharmacologic therapies such as cognitive behavioral therapy,massage, exercise, multimodal pain treatment, and osteopathic manipulative treatment. The plan should document any further diagnostic evaluations, consultations or referrals, or additional therapies that have been considered to the extent they are available. The mission: “Amidst Opioid Crisis: New Caucus Will Focus on Integrative Health Solutions. Make sure you contact your legislative representative and ask them to JOIN. Medicare Managed Care Manual Chapter 4 – Benefits and Beneficiary Protections. Revised for 2019 coverage Year also calls for more massage therapy as an alternative to Opioids. Massage Therapists are licensed as Health Care Providers in over 20 states. This is the list that I have so far, collected from various Facebook Groups so check the sources and let me know of any corrections.AL, CO, CT, FL, GA, LA, MI, MD (LMTs only) MO, NC, NM, NY, OH, OR, TN, VI, WA, Wa DC, WI, WV, WY.In most states, massage therapists can bill for car accident related injuries and for work related injuries.With so much interest and backing from prominent organizations calling for massage therapy to become part of the answer to the Opioid Epidemic, where is the Massage Therapy Profession? How to get massage therapy covered by health insurance in your state. Find out if you are licensed as a health care professional. Please find the link to a page in your laws that show that massage is licensed as a health care profession in your state and share in the comments. Find out what is happening in your state on creating a different law that would make health insurance companies cover massage. Find out what your AMTA chapter is doing. Here is a list of them on Facebook. https://www.facebook.com/lists/10151631915757567 Here is a list of them on the AMTA website: http://www.amtamassage.org/chapters/index.html Many of the AMTA Chapters are not currently doing anything but a few are. OH, WI, WV are working on getting laws passed that include coverage for massage therapy. If your AMTA Chapter is not working on anything and they are not interested in working on anything – Join them and tell them you want to be on the Government Relations Committee. You will need them to get a lobbyist to help you. A lobbyist costs about $40,00-$100,000 a year. AMTA should be paying for the lobbyist in your state. If you can’t get anywhere with AMTA, start your own separate state organization – like WA did – WA State Massage Therapy Association. . No one has been at the table for us and in the past 6 years or so – the insurance companies have been constantly reducing our allowable fees making it more difficult to make a living billing health insurance. This will be a much slower process as you will need to have enough members and make enough to pay a lobbyist. Keep working on AMTA Chapters until they let you do this or want to be involved. Write a letter to be sent to the OIC in your state. You will need this info for the OIC and use the above requests for massage therapy to be incorporated into healthcare along with these papers: MASSAGE THERAPY IN INTEGRATIVE CARE & PAIN MANAGEMENT (PDF) Published by the American Massage Therapy Association The Value and Efficacy of Massage therapy. Published by the American Massage Therapy Association Summary of Evidence (PDF) – How massage fits into the Essential Health Benefits (Created by AMTA-WA). Write a letter that clients can send to their insurance company asking for massage therapy to be covered. Write a letter that clients can use to send to the OIC. You will also need a Political Action Committee. WA State has one that was started in about 2005 to help support candidates who support massage therapy – WA Massage Alliance for Health (www.wamah.org) Our Every Category Law constantly needs protection and to get anywhere with healthcare, you need a PAC. Oh and why don’t we have a National PAC??? So there you have enough to get yourself started. These are just my suggestions after seeing what has happened in WA State and being on the Board of a few organizations. continue the discussions and start creating plans. Overcoming the Objections to getting massage covered by health insurance. My goal here is to get massage therapists to the table with the powers that be – insurance commissioners, health insurance carriers and legislators before they just jump in and make massage therapy covered by health insurance. From what I have been seeing, so many things are pointing us in that direction (see above), but we are not ready. We need to be part of the process of setting this up so we can have more of a say in what is set up. The health care system is broken. Yes it is, but it is what it is. What will it be like if/when it moves to a one-payer system? It takes too much time to bill and get paid. Billing health insurance is all done electronically and once you are credentialed with a carrier, the payment times are about two to four weeks. You have to do too much paperwork. Paperwork is really minimal and not much more then you need to be doing already. SOAP charting and filling out the CMS 1500 billing form are all done online. You won’t be able to work in the way you want and your massage will be dictated by the insurance. Not really. You won’t be able to do full body relaxation massage. It will be specific area massage therapy for rehabilitation of conditions like carpal tunnel syndrome, herniated discs, headaches and more. If you can support your massage work through charting, you can do it. It is coming folks…whether we/you want it or not. The clients/patients want massage therapy covered by health insurance. Why not be on the forefront of making it happen and have our voices heard from the start? getting massage therapy covered by health insurance.